We a group of bloggers run marathons , under our captain Srivalli ,where we post 3 recipes under a theme every week , but April and September are the two months where we post everyday...yes you heard right everyday . we work with themes. We have done Traditional recipes where we have picked Indian States, we have done international recipes..where we went around the world....we have dealt with alphabets ...seasons , occasions ...oh you need to check the amazing themes we have worked on. Today we begin with The April Mega Marathon and this time our theme is Baking.We are going to Fire up our Oven!! We can bake just about anything, provided it's fully a baking process. We have very good bakers in our group and most of them are professionals, I am no where near their standards but assure you of giving you recipes which are simple and healthy. I have divided my posts into 5 weeks...sounds strange? Well today being 1st April it is a Wednesday, and I shall be posting till Saturday as Sunday is off. So my week begins from Wednesday giving me 4 days till Sunday , so this is week one. Week 1 we have 4 days and these four days I shall post 4 breads. Week 2 we have all 6 days and you shall be treated to Bars , Biscuits and Cookies. Week 3 again six days and now we have tea cakes. Week 4 yet 6 days and Muffins and Brownies shall tempt you. Week 5 will have 4 posts and you shall see some decorative cakes . And the month is over, but wait I have extra posts which I shall post on Sundays too. So I shall be posting everyday including Sundays!! I shall not reveal these posts, as there should be some surprise element! So let's begin with Week 1 where I have chosen to make Breads, so for the first day it is a Polish Bread called Babka. Incidentally this was the first post that I worked on for the April BM. Babka , also known as baba , is a sweet cake which originated in Eastern Europe.the traditional bread had some fruit fillings, which included raisins and glazed with fruit flavor icing. This is often served during the Spring holidays. This is a modern version of Babka which is filled with chocolate and tastes absolutely amazing. A bread cake which is very very hard to resist. The chocolate can be substituted with jam or nuts. In a small saucepan, add milk and heat it to just the point where it is about to boil. Add butter, remove from heat, and give it a little stir. Stir the 1/2 tsp of sugar into the warm water. Once it is evenly distributed, add the yeast and allow it to dissolve. Whisk it and let sit for 10 minutes. The yeast should begin to form a creamy foam. Put the flour to a bowl. Add the remaining 6 tb sps sugar, salt and stir to mix well. Pour in the yeast mixture and the cooled milk. Stir from the center outward, incorporating the liquid ingredients into the flour. Mix till you for a soft dough. You could add a small amount of water if the dough is too dry or a bit of flour if too sticky. Turn out the dough onto a floured counter and knead for 10 minutes. Place it in a oiled bowl, cover with a damp cloth and place it in a warm place for 2 hours or till double. Add chocolate chips to the food processor, pulse till resembles a coarse meal. After the dough doubles, punch it down on the counter and knead for another 10 minutes. 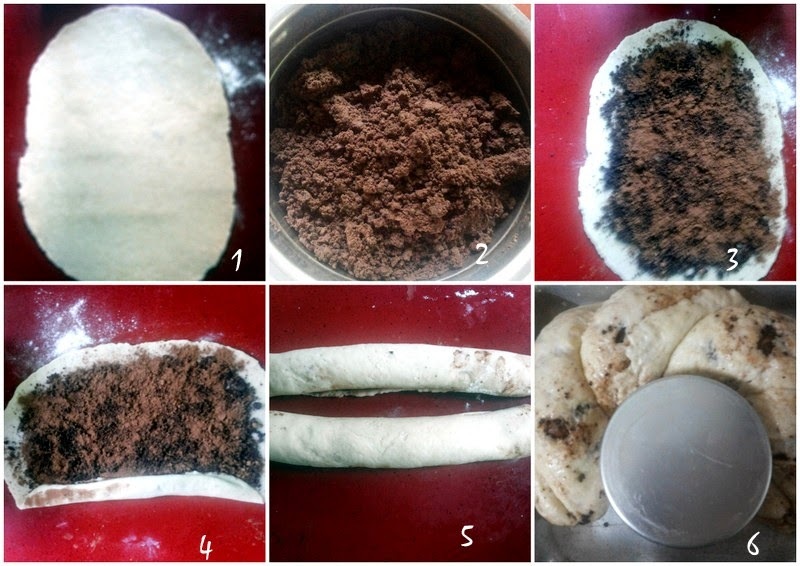 I divided the the dough into two parts. Using the rolling pin roll each ball into a big oval. Sprinkle the chocolate over this , leaving the rims. Roll firmly, the long way and seal the edges. Bring both the rolls together and twist. Lift carefully and place them in a greased bandit pan. Cover and let stand for another hour. Bake in a pre heated oven at 190 deg for 45 -50 minutes, or until sounds hollow. Remove and un mould , let it cool for 20 minutes. You could heat it up in the microwave for a few seconds to get that moist chocolate.